8 Output Bi-Directional Amplified Splitter is designed with a built in combiner for modulated signals. They allow IR signals to pass through the modulator input to the TV outputs, making it a perfect match for the E2200IR, E3200IR or E4200IR. The amplified splitter is designed to mount directly on any flat surface. 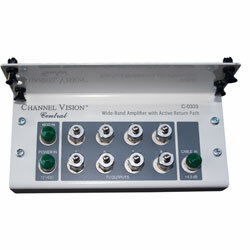 With 8 amplified outputs you can connect multiple TV's including: HDTV, cable boxes, or cable modems.